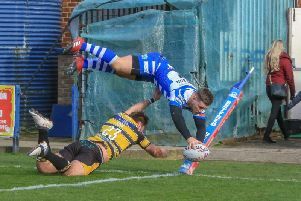 Halifax coach Richard Marshall has likened Friday’s Challenge Cup showdown at Super League outfit Wakefield (7.30) to the Championship fixture at Bradford on Good Friday. On that occasion, Marshall’s side took the contest by the scruff of the neck for 40 minutes, leading 13-2 at half time, before fading after the break against James Lowes’ full-time title favourites. “It’s a very similar kind of challenge,” said Marshall, who watched his former club Warrington post 80 points past James Webster’s Wildcats last weekend. “It’s a full time side against a part time side; you don’t don’t get as much time to make decisions in attack and the opposition make smarter decisions with the ball, so our defence needs to be bob on. “We need to start like we need at Bradford - like a house on fire - and this time maintain that effort through the 80 minutes. “Wakefield let themselves down against Warrington, but I think most sides will have one of those games in a season. Marshall could have winger Tommy Saxton and half back Ben Johnston available again, although the former Wakefield forward Adam Robinson remains a doubt with an arm injury. Johnston has not played since the defeat at Bradford on Good Friday because of a head cut and concussion, but has now been given the green light to return. Saxton had been due to replace Alex Brown for the game against Hunslet on Easter Monday, only for a back injury to force him to withdraw from the side before kick off. Whether either player makes the cut for Marshall’s final selection remains to be seen, although Saxton’s odds are potentially better than Johnston’s, who must try to oust the quietly impressive Chris Taylor from the stand off slot. “Ben will be in the 19 for the game, although that’s not a guarantee that he’ll play,” said Marshall, speaking ahead of Thursday’s final training session. “Chris has done okay, in fact he didn’t really put a foot wrong against Workington. “We’ve got another session before the game, but at this stage I would have thought it would be harsh to kick him out. “He’s the man in possession at the moment. “Tommy’s moving a lot better. We will have to see him in training, but I am hopeful. “I thought Alex Brown had an indifferent game at the weekend; he was good in defence, but needs to be smarter with the ball.